The T-shirt design will be used as the official 56th Annual Isle of Eight Flags Shrimp Festival design on apparel, marketing and advertising pieces, plus other items as needed. Past designs have included shrimp, shrimp boats, the eight flags of Amelia Island, pirates, pirate boats, downtown Fernandina Beach architecture, shrimp nets, gamefish and other ideas pertaining to the history of the Shrimp Festival. Past T-shirt designs can be viewed at our online store at https://shrimpfeststore.com/. If flags are used, they must be the historically accurate version. Overall maximum size of the design for T-shirts should be 13” wide x 14.5” tall. Ability to reduce digitally to accommodate placement on children sizes t-shirts is a plus. The design must follow the attached Detail of Art Specifications. The design must contain the information “56th Annual Isle of Eight Flags Shrimp Festival” AND the date location: “May 3, 4, & 5, 2019”, Fernandina Beach, Florida. Design will be selected based on originality, theme, use of color, overall appearance, and commercial viability. The decision of the Selection Committee shall be final, and the financial award shall be at their sole discretion. 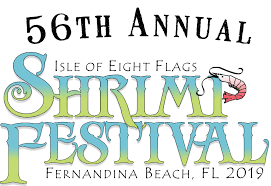 For more information, contact Andrea Mateer at merchandise@shrimpfestival.com. The festival is located at 96090 Windsor Dr, Yulee, Florida 32097. Application Deadline : January 2, 2019.